Interests - Cycling, swimming, reading, sewing, art, dolls houses, teenage fiction books. Alex passed away on the 8th of June 2005. Thank you to everyone who sent her some post. During the Spring of Summer 2002 Alexandra began to have what we referred to as “black outs” and was diagnosed with epilepsy. During the summer it became apparent that the medication was not working and an MRI scan was arranged on the 15th November 2002. We were given the results that day that Alexandra had a brain tumour and the results were couriered to Atkinson Morely Hospital in London.Alexandra went into hospital on the Tuesday and had her operations on the Wednesday, she remained in intensive care for 24 hours and went back into the ward on Thursday and she came home on the Monday. About a week later we were given the results of the biopsy which showed the tumour was a benign one called PXA and we were elated! Three months later a routine scan was shown to be “clear as a bell”!The next MRI scan was 9 months later and we were told that either the tumour had returned or there was scar tissue, but we would have to wait 12 weeks. That seemed an enormous amount of time but we got through it by being positive and hoping for the best.Unfortunately the scan in February showed that it was in fact the tumour that had grown back and another operation was arranged for a week later. This time Alexandra felt more ill and took longer to recover, she was distressed at having to go through this again. She came home after a week and we got the biopsy results a week later which showed that although the tumour was still benign it was more aggressive.The next three months went well but in May Alexandra had what we thought was a virus. A routine 3 month post-op scan showed that the tumour had returned. An operation was immediately arranged for the next week. This time the news was not so good, the tumour had changed and was now cancerous and the surgeon had not been able to remove it all for fear of causing Alex paralysis. After much discussion and heartache it was decided that Alexandra would be operated on again the following week. This time however they would wake her up during surgery and talk to her and get her to move her arm and leg whilst removing the tumour. The 3 ½ hours that Alexandra was in surgery felt like a lifetime. She is the youngest person in the country to go through this procedure, and she was extremely brave throughout. She then had 6 weeks continued radiation and chemotherapy during which time she lost her hair and then began her third cycle of chemotherapy. How can it be that just over 2 years has gone since our beautiful daughter left us? Last week she would have been 17 and so it would have been driving lessons next, there is always something that we are missing out on. Her little brother is now 11 months old and fortunately a very good baby. He has been a positive addition to the family and has helped Joshua and Bethany to focus on something good. We think of Alexandra all the time and many of her friends are still in touch. We know we are at the stage now where things will never get any better, and we just have to try and live each day, some are better and more bearable than others, but our lives will never be the same without our darling daughter. Thank you to all those who still keep in touch with Bethany and Joshua it is nice to know they have not been forgotten. I had a baby boy on 8/8/06 (14 months to the day that Alexandra left us!) We have named him Isaac Alex and he weighed 7 lb 1/2 oz, the smallest of my babies. Alexandra would be absolutely besotted with him and we think of her all the time. 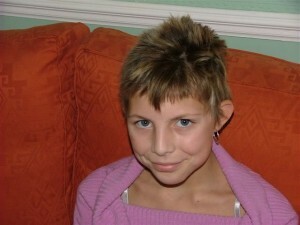 It’s now a whole year since Alexandra left us and we have to say that it does not get any easier, nor will it ever! Not an hour goes by when we don’t think about her, her beautiful smile and her bravery. She has missed so much this last year, doing her GCSE’s, going to the school prom, leaving school, and starting the rest of her life, whether going to work or college. There seems to be some milestone that she is missing every month. Alexandra’s uncle completed the London to Paris cycle ride and we are proud to announce that he raised over £1500 for the Paediatric Brain Tumour Research Fund! Thank you for continuing to contact Joshua and Bethany. We are still looking for sponsors for Alexandra’s uncles London to Paris bike ride in aid of the Paediatric Brain Tumour Research Fund. Alexandra’s uncle and two of his friends are doing a cycle ride from London to Paris at the end of May in Alexandra’s memory in order to raise funds for Paediatric Brain Tumour Research, which we all of course feel is a very worthwhile cause. Those of you who follow cancer treatments may have seen the recent report that the government is not agreeing to some new treatments being paid for by the NHS, and these are horrendously expensive, so only a handful of people would be able to go private. We were extremely lucky in that Alexandra’s Oncologist at the Royal Marsden ensured that she got the very best and latest treatment and it was funded by the Hospital, we are aware that not all children are so lucky. Of course in the end it didn’t work for our darling girl but it may have given her a few extra precious months for which we will always be grateful. If anyone would like to sponsor John in his cycle ride please let me Post Pals know and we will forward the details. Just to say we went to Antigua in December which was Alexandra’s favourite place in the world, and carried her wish on 8th December which was 6 months since she left us, and scattered her ashes. We had a small service and her dad and Bethany both said a few words, and then we scattered her ashes into the sea. It was very emotional but something that she had said she wanted before she left us. Thank you for the cards and messages still being received it is good to know Alexandra is still in people thoughts. She was on the front page of the recent Make a Wish newsletter describing the wonderful weekend we had in London. It is now 15 weeks since Alexandra left us, and it doesn’t get any easier, some days are worse than others but they are all bad. We are still being told by people we have never met how they have heard of her bravery and courage and she is touching lives still. Joshua struggles to go to school, he always had Alexandra there 2 classes above him, and now he finds it hard that she is not there. Bethany misses all the girly and sisterly things they used to do. Our lives will never be the same and we think of our darling daughter every day with love, smiles and tears. Thank you for keeping in touch with Joshua and Bethany. Still receiving some emails about Alexandra which is nice. Joshua and Bethany are struggling to cope with the loss of their dear sister Alexandra and appreciate the kind thoughts and gifts and emails which they have received, many thanks. It is with great sadness we announce that Alex lost her battle on Wednesday 8th June, she passed away surrounded by many family and friends. We took Alexandra on a fabulous holiday on 7th May, we flew to Disneyworld Florida for a week and visited all four of the parks, Alexandra had a wonderful time and was able to go on almost all the rides, the highlight was a trip to Discovery Cove where she swam with the Dolphins, which she has long wanted to do. She also loved Sea World. We then flew to Antigua and stayed in a hotel where we have been several times before, and where the Staff all know our family, so we were specially looked after. Alexandra was able to relax after the exhausting week in Disney and came home looking refreshed, when we left the hotel many of the staff, and a few guests, were crying, so it was a very emotional time! Alexandra’s health is now declining rapidly and she is relying on a wheelchair to get her around. Unfortunately the tumour in her lungs has developed rapidly and this is giving her the most trouble at the moment, and she is finding breathing increasingly difficult. Our aim is still to keep her pain free as much as possible. Alexandra has just finished her 2nd cycle of the new chemo and is now awaiting two scans in April, before continuing with cycle 3. She has been very tired and has missed quite a bit of school, although her spirits are quite good and she is enjoying her new puppy Pickle. Alexandra spend 9 days in hospital earlier this month with severe back pain, unfortunately it was discovered that this was caused by the cancer spreading to her back. Apparently it is very unusual for this to happen, less than 1% chance! She is now trying a different chemo, which lasts over 11 days, and by day 7 or 8 she is feeling very poorly and sick. She begins again on 14th March, she is pretty fed up at the moment. Alex is at home but feeling very groggy as a result of the new medication she is on. She’s not at school and finding the mornings particularly hard so it would be nice for her to receive some mail, to brighten those mornings up a bit. Alex is obviously well aware that her health has dropped and so that hasn’t helped. Alexandra has just spent a gruelling 9 days in hospital. She has also started a new course of treatment. She is now home but quite poorly and feeling understandably down, so could use some TLC at the moment. Please drop her an email or card. Alexandra is about to undergo her 5th course of chemo, and she will have another scan in early March to see how well the tumour is responding to the treatment.